This amusing episode explores the concept of grey goo end-of-the-world scenarios. The Professor, cold and shrinking in his old age, creates a machine that takes an object, scans it, consumes some matter ("any old matter will do") and then produces two slightly small copies of the original. In this way he can take is extra-large sweater and turn it into two smaller sweaters. 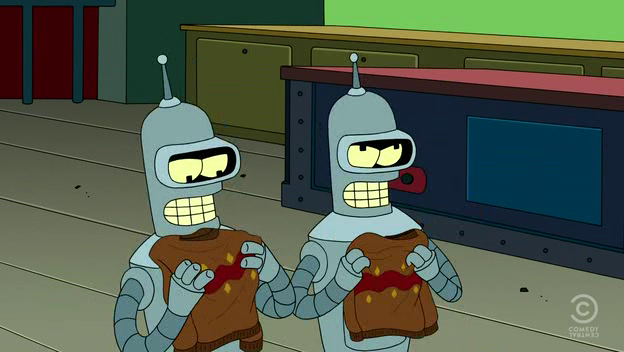 Bender gets a hold of it, and hijinks ensue. Has anyone ever heard of them? The Sheepdogs (from wikipedia) are from the whimsically named Saskatoon, Saskatchewan, and recently won a contest to be on the cover of Rolling Stone magazine. You've never heard of them because they were unsigned until they won that contest. Maybe I would have known that had I watched the first 30 minutes. At one point, Josh was actually serving as the voice of reason in the episode. I can't remember what he was saying though or what it referred to. Probably Olivier. But it was strange. I'd have to go back and look, (but I don't care enough to actually do it) but I think Josh's teary-eyed "I didn't get back to visit my Mom one more time" confessional must have been taped during this episode. I think he was wearing that blue shirt. Considering Kimberly is the pants-maven, I'm surprised she had such a hard time with this one. Somehow she and Anya both made the drummer look like Beck on a bad day. Oh, I'm sorry... As Heidi says almost every episode (as Diana pointed out to me) they made the drummer look like Beck "but not in a good way". Actually, both their tops kinda looked like the professor's sweater. Then, as always, the judges chopped the female chef and gave the win to the man. Ok, maybe his boxed mac n' cheese souffle dessert was better than her beignet's, and it sounded like neither of them did well in the entree round, but seriously? Even with 2 women judges, they still fell in line with the male dominated culinary world. Ok, I'm being hard on them. The Chopped Champion final will have 2 men and 2 women, but you can bank on one of the men winning. None of those outfits looked good. Seriously. At least the band seemed to have a good sense of humor. Bert's styling made the guy look like Pippi Longstocking, not a Viking, and I thought the purple striped pants were the best part and the shirt the worst. Not the other way 'round. I'm looking at you Adam Lambert. Or rather I'm looking at the walking blob of spray tan underneath which I presume is you. None of those guys would ever wear one of those outfits on a stage. And, hello, when you're a rock band onstage doing a show, you ARE wearing a costume. Wait, there must have been a winner. I would have given it to Professor Farnsworth for his sweater or maybe Chef Marie-Claude. Instead, Viktor finally triumphed over Josh, the Rolling Stones to his Beatles, with his pleather braided fringe jacket and distressed jeans that looked like something you could buy at just about any jeans store that still sells ripped jeans.Still, better than Josh's crotch-zipper mud-flap pants. Anya survived even though FINALLY her lack of sewing skills finally tripped her up. Olivier was going home before this episode even started, so no real suspense there. He does one thing and only one thing. He cannot work with people. His outfit looked like something an old lady would wear. I mean, they were all too feminine looking, because they all design women's clothes. Even the handful who do menswear have been designing clothes for women for the last 8 episode.